"Wat-er you takin' a pitch'er of?" for the Spring Competition? 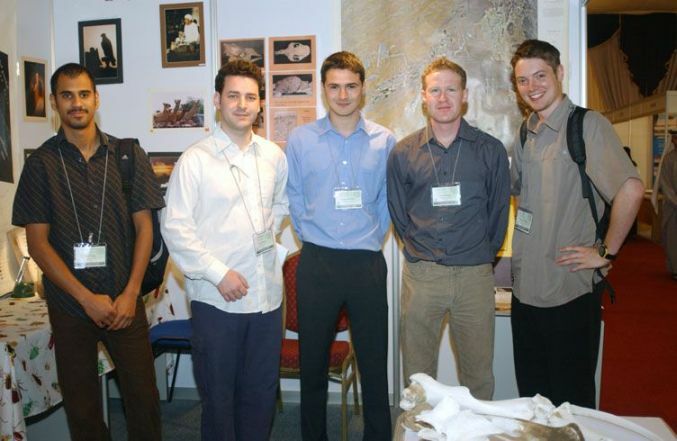 The Second Scientific Conference for Medical Students in GCC Countries was held from 25 to 28 January, 2004. The organisation involved students and staff of the Faculty of Medicine and Health Sciences of the UAE University. A major role as "advisor" to the students was played by Dr Chris Howarth, a faithful member of ENHG. He asked the author if ENHG would like to organise a stand in the exhibition tent, and I was happy to agree, with the backing of our committee. Brigitte Howarth and Will Moore volunteered to share manning the stand with me, and Brien Holmes sorted out a quantity of potentially interesting items for display, including pottery and fossils. The Opening Ceremony included addresses by Sheikh Nahayan Mubarrak Al-Nahayan (Chancellor of the University, and patron of ENHG), Professor George Carruthers (Dean of the Faculty of Medicine & Health Sciences) and Dr Abdulkareem Sultan Al Olama (Conference Coordinator). The ceremonies drew to a close with the inauguration of the Exhibition. 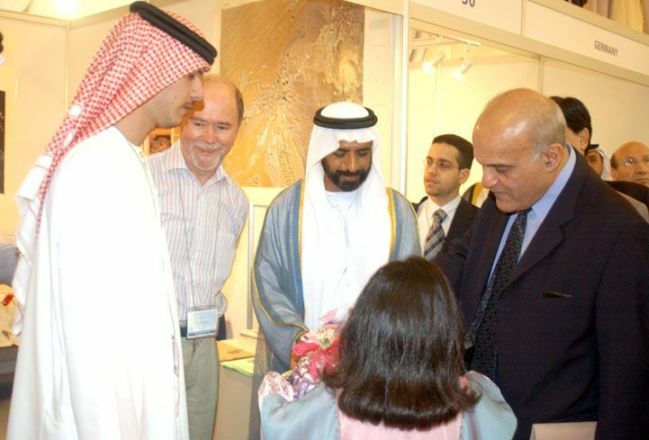 This was held in a giant tent constructed specially alongside the faculty building at Tawam, and Sheikh Nahayan stopped at our display and seemed well pleased to see us! The conference was attended by about 700 registered delegates from 31 countries. 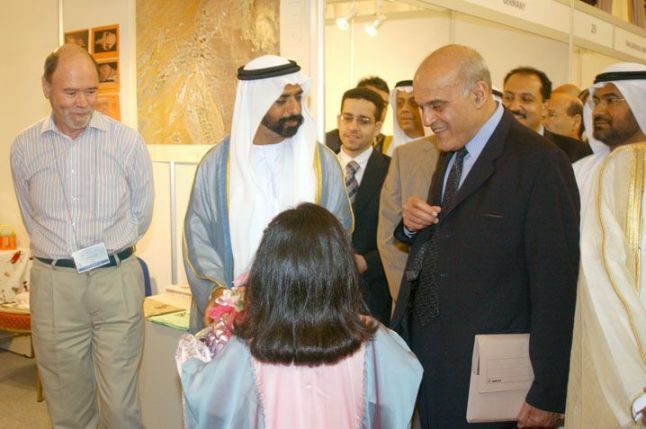 The largest delegations came from the UAE, Saudi Arabia, Sudan, Kuwait, Oman, Bahrain, Iran, UK and Australia, but there were Iranians and Japanese, among others. Activities included presentations on topical biomedical themes by Professor Sir Magdi Yacoub (Imperial Col-lege London, UK), Professor Nuala Kenny (Dalhousie Medical School, Canada), Professor Angelo Azzi (University of Bern, Switzerland), Dr Amer Awadh Al-Rawas (Omantel, Oman) and Dr Abdulla Al Naeemi (Zayed Military Hospital). More than 80 oral presentations and 140 posters were given by students. Ten workshops dealt with practical issues of concern to medical students. Social and cultural events included a poetry night, tours of Al Ain museums and forts, visits to Dubai followed by a dhow dinner cruise, and tours in Sharjah (Natural History Museum) and Abu Dhabi. 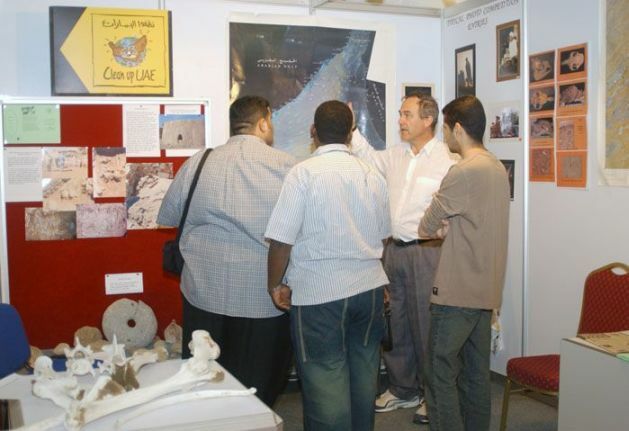 A group of visitors inquiring about the ENHG Al Ain Chapter's activities in the UAE. Where do you go? What do you find? What can you learn from these things? Excellent questions indeed. For our stand, we had an area of 3x3m, equipped with one small table, so we had to beg and borrow extra tables. There was electricity, but no extension cable, so more begging was needed. We decorated the walls with maps, satellite views of Al Ain and the UAE, and some abandoned former entries to photo competitions (lucky we have the workroom to store all these old treasures!). I also printed out some pictures of our camel brain pro-ject results, and of various archaeolo-gical sites (Hili, Al book Buhais) where we have collaborative projects on DNA. I also put out a number of camel bones so that students might compare them with similar human ones. Brigitte displayed some moths and butterflies, and her recently collected Death's Head Hawk Moth caterpillar (all singing, all dancing), that was provoked into pupating soon after (she tells me). Brien also provided CDs of ENHG history and activities that we played on Will's laptop. Various brochures and flyers completed the ENHG contribution, most of which were collected avidly. The number of visitors to our stand was satisfyingly high. Students from far field as well as our own students seemed to enjoy seeing an aspect of Al Ain life that they did not even know existed. Some of our local students declared a firm intention of trying to participate in our activities in the future. It was also gratifying to have visits from more senior personalities, including Gertrude Dyck ("Doctor Latifa"). The tent stood up well to the onslaught by so many visitors, but slightly less well to the unexpected rain that hit us on two days! We were worried about the effect the minor floods might have, but neither our stand nor the very big displays were damaged. An army of cleaners with powerful vacuum cleaners got the upper hand of the deluge. Thank you to Chris for inviting us, and also to those students who helped us organise the stand and find the bits of equipment that were missing. A few of the many visitors to our booth. Global climate change is a complex topic that has become extremely politicized. This article summarizes my talk at a recent ENHG meeting and attempts to present some facts that are agreed to by most of the scientific community. The graph on the left shows temperature changes in Europe from about 900 AD to the present. The climate was stable in the early Middle Ages, a time of a stable feudal society and Viking colonization of Greenland and Iceland. About 1400, temperatures dropped quickly. The Viking colonies were starved out, agricultural production in Europe plummeted, the Black Death ravaged weakened people, and the population dropped 25%. Fallow land and a labor shortage hastened the end of feudalism, while a warming trend in the mid 1500's aided economic growth and a population increase. Temperatures dropped again in the mid 1600's. Colonies in North America faced an annual 50% fatality rate while paintings in Europe show many snow scenes, such as skating on the canals of Amsterdam. Important points are (1) climate change can occur quickly (2) a change of only 1.5 C had a major impact on European social institutions. 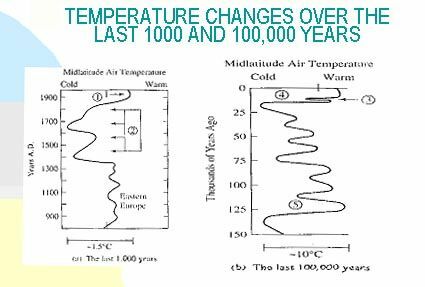 The graph on the right shows temperature changes over the last 150,000 years. Ice ages occurred at temperature minimums, with temperature changes of 5-10 C. Some, but not all, of these changes may be related to variations in the earth's orbit around the sun. Important points are (1) Global climate change can occur without human intervention (2) the earth's temperature now is as hot as it has been in the last 150,000 years. Climate change has many causes, but the increase over the last 100 years is most likely due to human induced increasing concentrations of greenhouse gases: carbon dioxide, methane, nitrogen oxides, chlorofluorocarbons, and ground level ozone plus soot. Although attention is focused on carbon dioxide, the combined effect of the other substances is as great as that of carbon dioxide. It is also important to remember that in addition to industrial emissions, the increasing production of meat, rice, and other agricultural products generates substantial greenhouse gases. Predictions on future temperature increases are complicated by the cooling effect of sulfate emissions from coal burning power plants, cloud height variations, ozone levels, volcanic eruptions, etc. Depending on the assumptions made by current models, average global temperature will increase as little as 1.4 C or as much as 5.8 C over the next 100 years; sea levels will increase as little as 9 cm or as much as 88 cm. If the latter sea level increase is correct, global warming would have a catastrophic effect on populous low-lying countries. Unfortunately, current predictive models are based on temperature changes over the last 200 years. These models don't predict the temperature variations experienced during the Middle Ages because the reasons for the changes are not known. One concern is that the earth's temperature is a metastable system, and small perturbations can kick it into another temperature range. It is entirely possible that current high temperatures will trigger an ice age within the next 20 years. It is also possible the earth will continue to heat up, with resulting extremes in rainfall, violent storms and drought in interior continental regions. No one knows. Whichever occurs, it is unlikely that the social institutions of a world with 6 billion people can respond as quickly as the climate can change. This is why it is important to stabilize the current temperature increase. Water! You can drink it, swim in it, wash in it, drown in it. It is also the single theme for the ENHG's Spring Photography Competition, 2004 edition. Water in the UAE or Oman? Yes, of course. The coastline is bathed in it. In Al Ain? Well, why not? Garden City. We have fountains, sprinklers, aflage, pools, skating rinks. Look around! Keep in mind that water includes ice and snow and steam and cloud and mist and other forms too exotic to mention. The purpose of the spring competition is to have a bit of fun and see what you (and other people) can do with the theme. Last year our theme was 'light' and we had a picture of the glow on the end of a cancerstick entitled "First Light of the Day". Two years ago with the theme 'tracks' we had 'Tales of the Trail of Carmen the Caramel Camel'. Who knows what splashes 'water' will give? Conventional interpretations of the theme are fine as well. Moving water can supply some excellent images but can be a challenge. Here is where the shutter speed and aperture settings of the camera come into play and where point and shoot cameras are at a real disadvan-tage. A fast shutter speed freezes movement; a slow one blurs it. Whichever image you prefer will be a mat-ter of personal taste, but there are further considerations to keep in mind, which relate to the relationship of speed to aperture. Consider Figure1. This photo was taken with a relatively fast shutter speed (1/250th sec) and the moving water is more-or-less 'frozen' in place and appears quite natural. Fine so far. 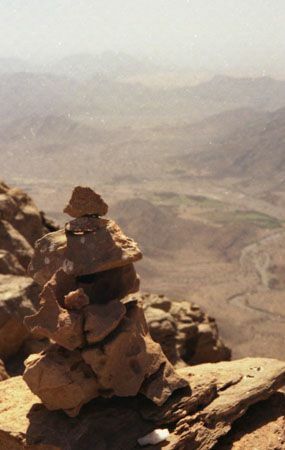 But notice that the rocks in the foreground are out of focus. That is because the fast shutter speed used a wide aperture (f4.6 here); a wide aperture leads to a shallow depth of focus. This may or may not be a problem, depending on where you stand in relation to the moving water and how much foreground is actually in the picture. Now consider Figure 2. Same subject, with the camera set at f22 and 1.5 sec. Both the foreground and background are in focus (narrow aperture, wide depth of focus) and the moving water is blurred, an aesthetically pleasing but unnatural appearance. The difficulty which often arises here is due to camera shake. Nobody can hold a camera steady for one and a half seconds, which is why I carry a tripod. If you don't have a tripod, a handy rock or other support can sometimes substitute. There are other complicating factors, such as film speed and filters, but this is enough for now. Reflections are fun and often provide very striking images, but don't forget what's at the bottom of the pool. A polarizing filter can enhance or get rid of glare or reflections and hide or bring out underwater features. Experiment! It may be difficult to decide which is the better photo. Seascapes are always popular and provide some spectacular images. Keep in mind that the horizon at sea is horizontal. Otherwise excellent shots are spoiled if the water seems to be running off the side. This sort of problem is easily fixed with a straightedge and a razor blade or, for digital files, with the crop tool in Photoshop 7. Just a reminder of the rules of the spring competition. All photos must have been taken in the UAE or Oman by an amateur photographer who is a member of the Al Ain ENHG. Prints must be mounted (not framed) and the following information provided on the back: Name of the photographer and contact infor-mation. A title for the photo. Where the picture was taken and approximately when. Prints should be a reasonable size - neither postcards nor excessively large. A maximum of three prints may be submitted by each member. We plan for the show and judging to be held on June 8th, with the deadline for submissions two weeks before that date - ie May 25th. Judging will be 'People's Choice'. Photographers retain copyright but we assume permission to scan prints and include them in a PowerPoint show which may be offered for sale. So, go out there and take lots of pictures. Good luck! The 7th Annual Corporate Gala Dinner for the Emirates Environment Group was held at the new Mina A'Salam Hotel, Madinat Jumeirah on December 16th, 2003. Since the Al Ain Chapter of the Emirates Natural History Group was presented with an award for our participation in the "Clean Up the UAE" campaign, I represented our group at the dinner. Held under the patronage of H.H. Sheikh Ahmed bin Saeed Al Maktoum, President of the Department of Civil Aviation and Chairman of Emirates Group, the evening was first class. We were entertained by the Emirates Youth Orchestra. Habiba Al Mar'ashi, Chairperson, Emirates Environmental Group gave a report on the year's extensive activities for the EEG in Education, Waste Management and other environmental projects. The many corporate sponsors of EEG were thanked for their participation with the presentation of a unique crystal award, as were EEG partners such as ourselves. I enjoyed meeting representatives of the Kanoo Group and the company that prints EEG publications. It was an enjoyable and enlightening evening and I feel very fortunate to have been able to represent the ENHG. 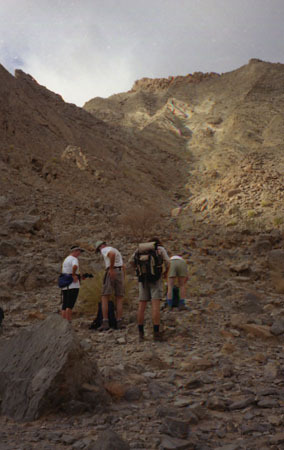 February 19th, 7:30 am, saw a group of ENHGers gather at the Buraimi Hotel for the ascent of Jebel Quwayal in nearby Oman. The drive out to Mahdah, Nuway and then beyond to the base of the "Swiss Mountains" took about 50 minutes. Eleven adventurous souls started out, first crossing the last bit of plain, then up the shady side of a great swale of boulders almost to a col ridge. Off to the right over difficult terrain, round the backside, back to the front, up a ladder-steep face and onto a false summit, along the top, one last scabble up some pretty open faced rock and onto the actual summit. The hike took 3 hours. And only five souls made it. No easy climb, this one - people were tried sorely and many opted for safety over risk. Thank you for being cautious. The scraped knees and sore muscles were well worth the trip. The climb was done 95% in the shade. The descent was more challenging taking some four hours to complete. In the end all 22 tired soles made it back to the vehicles. Congratulations to all who participated. A special note - we all forgot to bring cameras! - so this piece is very short indeed. But I assure you - the view was spectacular, the climb well worth it Hope to see you there next year - with cameras. 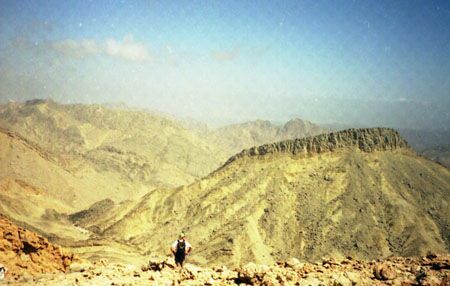 Jebel Quwayal or "The Swiss Mountains" so-called because they are so white they appear to be snow-covered (if you have been out in the sun long enough. The week before the hike, Brien Holmes and friends checked the route to the base of the mountain. It looks easy, but don't be fooled. This is the swale we ascended, with the highest peak to the right. 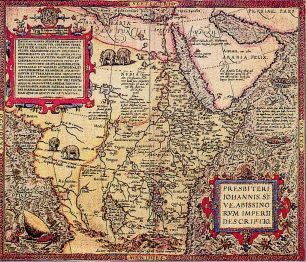 Ortelius (1527-1598) - Prester John Map done by "Ortelius and Family"in about 1570 for the Portuguese depicting Africa.but focusing upon the area between Mozambique and Alexandria. Abraham Ortelius was a Dutchman. He and his sisters became map illuminators and colourists after their father died. Ortelius was in fact an antiques dealer and in 1558 he bought large quantities of maps in order to colour them and build a large personal collection. From 1560, probably as a result of his friendship with Mercator, he began to produce maps; an 8 sheet world map being his earliest. By then Ortelius was probably the greatest cartographic bibliographer of the period and generated 53 map sheets based on the most current information. These was expertly engraved by Frans Hogenberg and published in 1570. The sheets achieved instant fame and recognition, so much so that in the same year there were four reprints and many more up to 1612. Those later editions expanded eventually to 163 map sheets, finely engraved in either original black and white or full colour. Maps were engraved upon a block before being stamped onto sheets of paper. Early maps used a somewhat crude woodblock engraved stamp (see Ptolomy article) later, more accurate copperplate engraving was used. The transition to steel plate engraving in the 18th/19th century provided an even sharper image but today maps are laser printed with high resolution satellite enhancement and funny things called pixels and are accurate to a few centimetres. The fine colouring work of his sisters can clearly be seen on the earlier delightfully decorated masterpieces. Particularly nice are the fabulous animals and the illustrated Lanteen Sail Dhow which ran circles around the big lumbering juggernaut Portuguese Battleship Traders and other European square riggers. There are some interesting myths illustrated: the Nile is shown with its source as two huge lakes, Zaire and Zaflan, in the middle of Africa. In fact practically the whole map is a myth; Portuguese passion for that fabled leader "Presbi-teri Iohannes"(~ Prester John~) so called King of a nonexistent Christian Kingdom somewhere in the horn of Africa was to puzzle the Portuguese for decades. It and he never existed. This illusive kingdom caused many deaths as expe-ditions came to grief in the fruitless search. They were desperate to employ Christian Mercenaries from "Prester John" but eventually settled for Hindu soldiers to do much of their fighting. Despite the inaccuracy of the map, the Portuguese were great explorers and pioneered sea routes with help from Arab navigators to India and China and had their own map experts. Bartholomeo Lasso in Goa whose manuscript and illuminated map actually sits in the Al Ain Museum. Many thanks to Mary Beardwood for her wonderful presentation on the production of her first book, The Children's Encyclopedia of Arabia. This is obviously a labor of love. It is a high quality hard-cover production published by Stacey of England (160 pages) with clearly defined sections, excellent graphics and well-researched information. You will feel quite comfortable putting it together with other coffee-table books in your living room, and will have a wealth of information at hand - the kind that is being lost by the young generation who have little appreciation for the way life was only fifty years ago. Not only did we get to see the material in the book, we were lucky enough to learn the history of the endeavor of putting the book together. Mary kindly acknowledged the many people who contributed so generously to her book with information, pictures and sources. 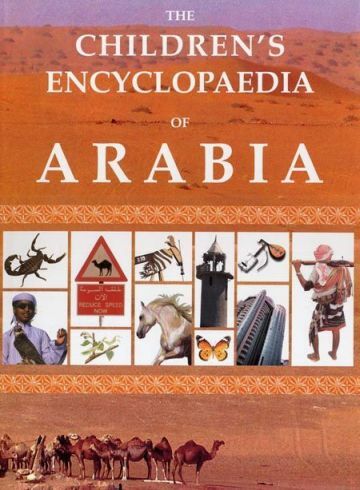 The encyclopedia deals with the envir-onment, both natural and cultural, with history, again both natural and cultural, and with the poli-tical evolution of the United Arab Emirates. It does not attempt to be a complete account of any of these topics, but gives an excellent introduction to each. 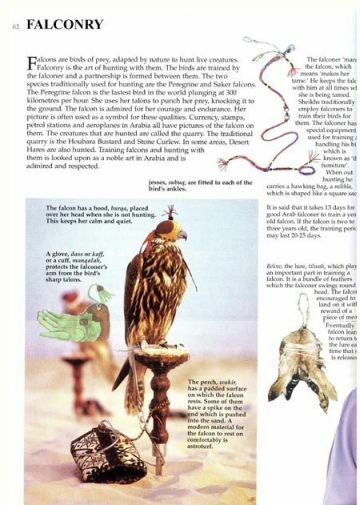 You will find information on endangered species, desert life, frankincense, Islam, pearls, and more. The list is quite extensive. The presentation is suitable for all ages and intellects. Teachers were quick to pick up a copy for use in their English language classrooms. The question was asked, "Is the book being translated in to Arabic?" Sadly the answer is still, "No." as it is an expensive undertaking and to date no one has stepped forward to do so. The challenge has been put fellow ENHGers. How do you feel about it? Would you support the effort to have this book translated into Arabic? Is this a worthy cause for a "natural history" group? I think it is, and I would like to hear your thoughts on how we can do this most efficiently. If you missed the presentation, you might still be able to find a copy in McGrudy's bookshop in Dubai. High quality graphics, great layout and accurate information make this book special. In the beginning was Brigitte! She, who entered the underground falaj at A'Dhahir and emerged unharmed. And she saw that it was good. 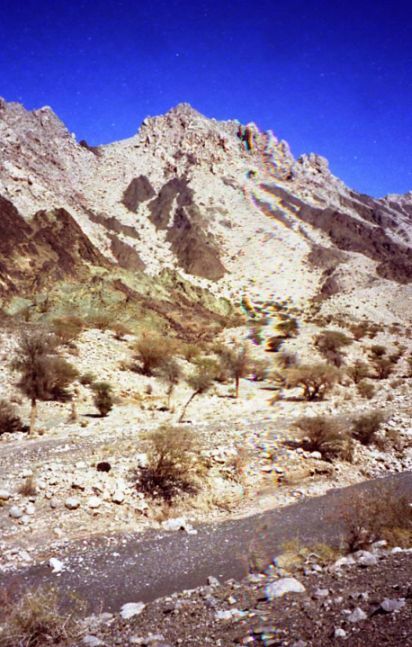 A'Dhahir is a village in Oman, between Jaziera and Subaitha. It sits on the edge of a deep ravine, with farming terraces at the entrance to the village and oases and farming plots within and on the slopes of the ravine. 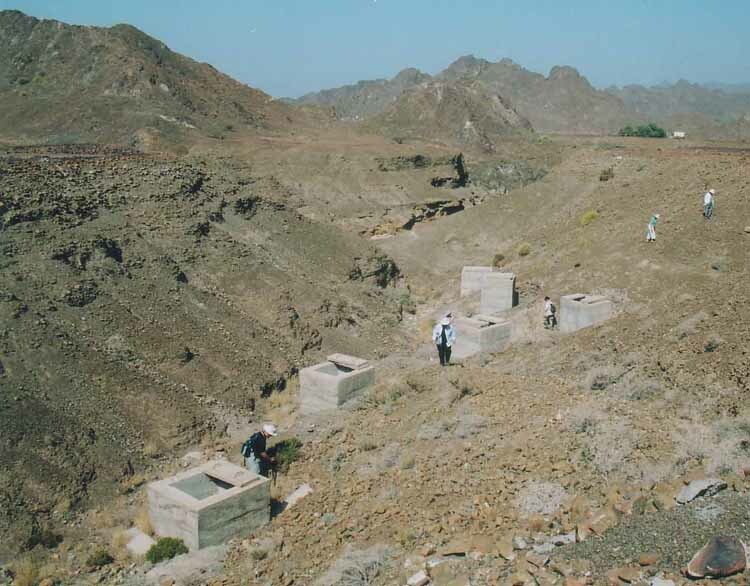 Water for agriculture comes via two aflaj, one of which runs in an underground channel before emerging to flow to the oases. This channel is accessable at a concreted adit. Ten concrete inspection and maintenance ports on the surface mark the underground route of the falaj and three more pits mark its continuation and (presumably) termination. Some time after her initial exploration, Brigitte and I investigated this underground falaj by wading in the swiftly flowing falaj water. 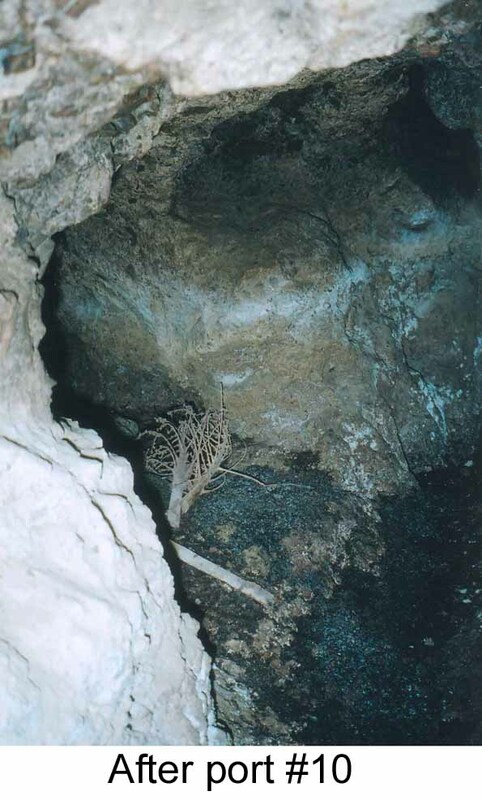 The passage is narrow and irregular and very dark, except when emerging into the light of a maintenance port, where the cave opens up and extends up to the surface. Of note were the bats - more specifically, one bat which took a liking for Brigitte's shirt, clinging long enough for me to take a couple of photos and then transferring his or her allegiance to my shirt, enabling me to pass the camera to Bee who took one or two more pics. 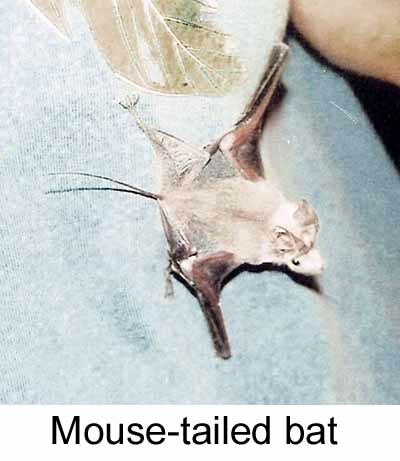 We later identified the bat as a mouse-tailed bat (Rhinopoma muscatellum). This February 21st, we revisited this underground falaj with the ENHG. Unfortunately, we left our torches (and our brains) behind. Undaunted by this intelligence lapse, five of us plunged into the Stygean depths of the cave. Before long, one of the group began to feel a major claustophobic attack coming and (very sensably), returned to the surface. The rest of us proceeded in the dark until finally emerging in the light of the first inspection port. While wading in the dark, we felt bats brushing by us and in the light of the portal areas, we could see them on the wall, though none came close enough to get a good view. Inspection port number two followed swiftly along after number one. Then numbers three, four, five, and six. At six we decided to turn back and to return another day, properly equipped with torches. We emerged into bright sunlight and found that our colleagues who remained outside, had also been busy. Specifically, Bob had followed the inspection pits upstream, aking GPS coordinates of all of them, as well as discovering the three unconcreted pits. We retraced Bob's steps, ending at uncovered pit thirteen. A stone dropped into this hole did not result in an audible splash, suggesting the falaj's spring bubbles out of the ground further down. We couldn't leave the situation thus unresolved, so six days later, a fourth inspection of the underground falaj was made. This time we took torches and the assault force was much larger - eleven! Luke, David, and I led and the others followed. With the addition of lights, the passage was much less claustrophobic. The walls were no further apart, the falaj water no less wet, the bats no fewer, but it was somehow more comfortable. We pressed on, past our previous turnaround point. The passage way became narrower. I had to turn sideways and kept being caught up by my bumbag and camera. The ceiling was low in places. But we pressed on. Finally (after inspection port 10) we came to a branching - a place where further passage would have been foolhardy (not to mention stupid), since we knew that there were only 10 active inspection ports and the surface pits were overgrown and unused. Luke went down a short distance but we all agreed that discretion was the better part of valour and now was the time to return. We met our fellow falajonauts on the way back and had the chance to reacquaint ourselves with the fauna of the cave. There were lots of bats, of the mouse-tailed variety. We also came across a gecko on the cave wall. No lions or tigers or bears (oh my!). We had already noted wadi fish We counted the bright portal areas (confirming we had made it to number 10) and ended up at the adit to the cavern which became the exit. Quick struggle out of the cave, confirmed that everyone had made it, group photo and it was off to look for copper mines (another story for another time). Geckos have to be amongst the most appealing and interesting animals. They are small, harmless lizards with big soft eyes, and yet have some of the most amazing adap-tations to be found in the animal kingdom. 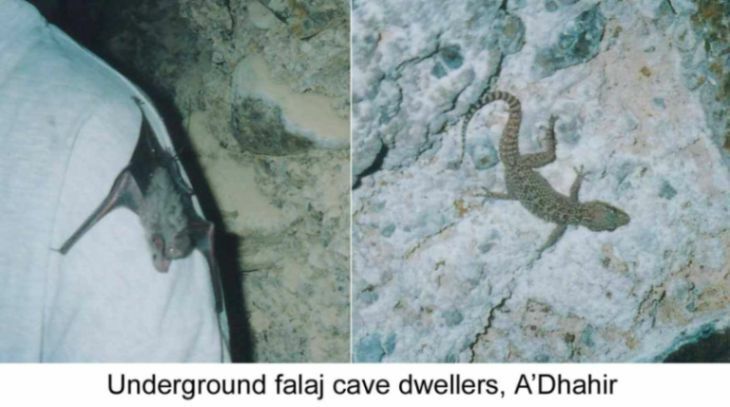 Moreover, our region (Oman and UAE) is a gecko paradise with at least 27 species with a wide variety of adaptations and life styles. Geckos are one of the 16 families of lizards, others being skinks, agamids, chameleons and monitor lizards. World-wide there are about 800 species of geckos, mainly found in tropical and subtropical areas. Europe can only manage 4 species and the UK, none at all. Perhaps the most familiar gecko here is the yellow-bellied house gecko, Hemidactylus flaviviridis. This is the species found on many houses. They are usually seen at night on walls and ceilings, particularly around out-side lights where they lie in wait for their prey of moths and mosquitoes to land within range. It is well worth watching a house gecko for a few minutes to appreciate its fantastic climbing skills. The geckos have no dif-ficulty in climbing vertical walls, walking upside down on the ceiling or even across panes of glass. Studies have now shown that the gecko toe pads do not use suction, glue, or electrostatic forces. And it is not friction or use of microscopic irregularities in the surface, as climbing geckos can just as easily walk on super-polished glass. Instead, each of the specialised scales on the underside of the toes has up to 150,000 microscopic hair-like projections called setae. Each seta is about 1/10th the diameter of a human hairand each branches at sev-eral levels, giving rise to hundreds to thousands of saucer-shaped end plates called spatulae. A large gecko has billions of these. Considering all the setae on all the toes, the total surface area of all these spatulae is huge. Recent research has shown that the attraction is mainly due to van der Waals forces which are attractive forces at the atomic level. A team in Berkeley California has been able to measure that attractive force of a single seta using a micro-machined measuring device. It turns out that a single seta could lift an ant, and that setae covering the size of a dirham could lift a man. A gecko can hang from a single finger. This of course begs the question of how a gecko unsticks its foot to take the next step. The answer is that the force depends on the angle of the seta. If the hair is levered up at 30 degrees the hairs easily unstuck and a gecko has highly specialized foot anatomy, with special muscles and blood sinuses that fold each toe onto the surface and peel it off again. The different species of gecko vary greatly in the structure of their feet. 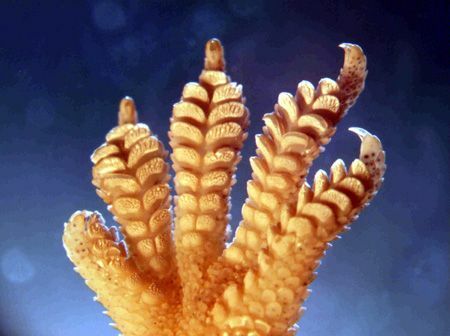 Species which live on vertical rock or trees usually have adhesive toe pads(e.g. the Hemidactylus and Asacus) species, while those that live on rocky ground or on sand have no need for such devices, and have more usual lizard toes (e.g. Stenodactylus, Pristurus and Bunopus). As most geckos are nocturnal, they have large and very sensitive eyes. Most nocturnal species have complex pupils that open wide at night, but contract to vertical slits during the day to protect the sensitive retina. How-ever the geckos can still see well in bright light as the slits have slightly enlarged pinholes to let in sufficient light. Geckos do not have moveable eyelids, and so cannot shut their eyes. Instead the eye is covered by a transparent spectacle, which is periodically shed along with the rest of the skin. It is not uncommon to see geckos clean their eyes by licking them with their long, rounded tongues. The retina of geckos has been the subject of much study. Almost all vertebrates have a dual visual system - multiple types of cone cells enable them to see colour during the day, while highly sensitive rods enable them to see during the night, but not in colour. In general, diurnal animals have more cones and fewer rods. Nocturnal animals have lower cone densities and often fewer spectral types of cone than their diurnal relatives. Among the reptiles, lizards have been day-active for such a long time that they have completely lost their highly sensitive rods. 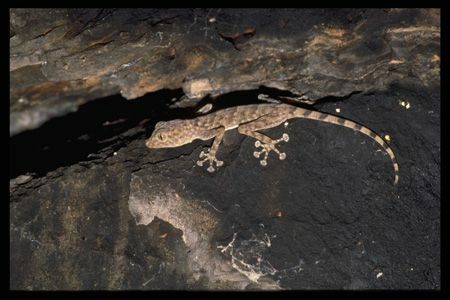 Later in evolution, some lizards - the geckos - turned to a nocturnal lifestyle. As a result, gecko cones became very similar in morphology and function to the rods of other vertebrates, but with one significant difference: geckos retained several spectral cone types. They might thus be the only vertebrates that use three spectral types of photoreceptor to see at night. February 26 was cool and cloudy at 7:00 am as our group set off from the Buraimi Hotel. The drive took fifty-five minutes and we began our trek at 8:10 am. I was nervous. Did I have the stamina for this one? 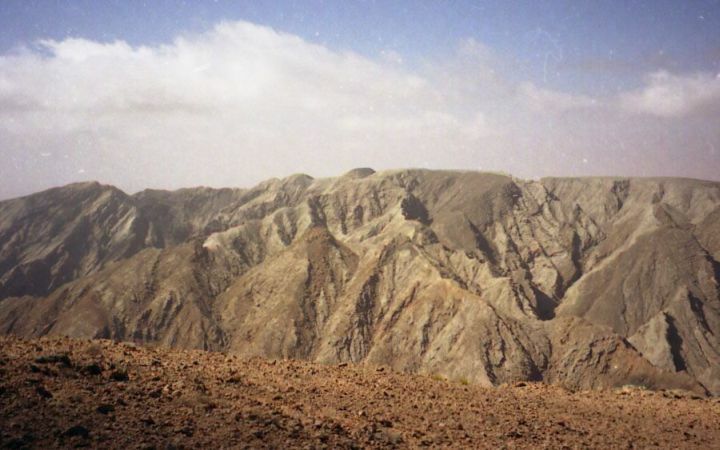 We couldn't even see the top - and what we could see looked bigger than Jebel Qawayal! Onward! 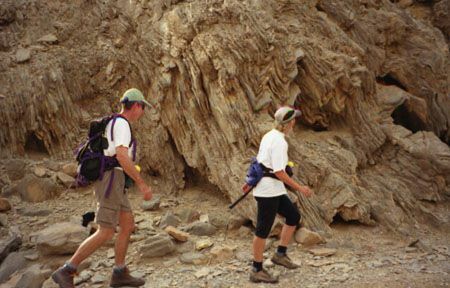 - after perhaps 30 minutes of simple wadi walking we came to a marvelous example of folded and faulted sedimentary rock. This alone is worth the short hike in. And this is where the climbing really begins. We took the right fork in the wadi and ascended the first side defile up a steep slope.. At the top of this climb is a hanging valley wadi which we followed for perhaps 45 minutes. Then we began the second ascent. This one steeper and longer than the first. From here we got our first view of the top of Sumaini, though only a glimpse. We followed along the rounded ridge top, finally coming to a small descent. The view of the third climb was terrifying. It looked like at least another two hours would be needed, ropes, spurs and crampons perhaps as well. But looks can be deceiving. We were up the boulder strewn cliffs in only thirty minutes, no ropes, no real climbing, only a couple of small 1.5 m faces to overcome, and we were almost there. This mountain just keeps on going. And finally over the last rise we saw the cairn marking the summit. Lunch was our reward after only a three and a half hour hike. The views are incredible. We took a different route down the mountain than up, descending a real subduction seam. Here two different types of rock plates meet, one a flat sheet of rock, diving under a second rock type- the layered shale we had seen in the first wadi. The angle was very steep, but footing was good on the sharp crystalline rocks. There is no trick photography in this picture, it really was this steep! You just had to lean back and keep one hand on the wall of layered shale rock. We were all down the mountain and back at the cars by 4:00 pm. - just over a three hour descent. Remember - if you are going to do this hike, take plenty of water, don't do it alone, take lots of good snack foods, and some real food just in case - make sure someone back home knows your plans and knows when you are "overdue" - leave early and give yourself lots of time to complete the trip. UAE cell-phone reception is good at the top, but not enroute. Take a good camera - there are lots of fantastic views. Never push yourself harder than you know you can manage. Enjoy the experience. And thank Ibrahim for all his fine efforts in keeping this tradition alive for so many years. Shukran Ibrahim! Looking over the top at the mountains across the Sumaini wadi valley. 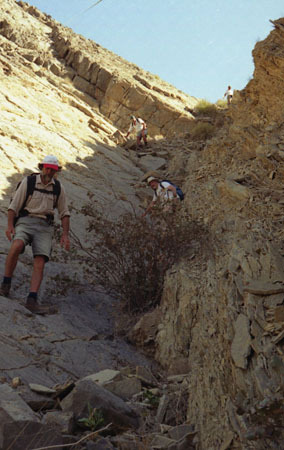 The folded and faulted rocks at the base of the climb. The view from halfway up the second ascent (left). The same view from the top of the second ascent (right). This view takes a little more effort to gain! March is typically the busiest time of year for the AIC of the ENHG. This year is no different. We have the following special activities and dates confirmed - look forward to seeing you there. March 3 - 5 - The Al Ain Annual Classical Music Festival - Once again the ENHG will be offering tours to a variety of spots of interest around the Al Ain area. Advance Registration is at the Intercon Hotel on Wednesday afternoon, March 3. There may also be an evening outing or two over the weekend. The past two months have been quiet ones for ENHGers. What with Ramadan ending and Christmas beginning, holidays and the New Year, term end vacations and graduation weeks, many people have been away and the activity level has been peacefully calm. We had some excellent presentations: from Tom Weeks (Jan 10th - A Layperson's Guide to Global Climate Change); from Dr Kath McSweeney of Edinburgh University (Jan 20th - The study of ancient human bones from the Hili site, Al Ain); Mary Beardwood (Feb 10th - A Children's Encyclopedia of Arabia), Drew Gardiner (Feb. 26th - Gecko Biology). We have taken numerous weekend sorties to Wadi Khudra (the Dubai students project), Wadi Jazeera (garbage cleanup and orange gathering), Wadi Aboul (ancient sites), Wadi Subaitah (just looking), A'Dhahir (falaj spelunking) and Wadis Jimi and Qatara. The Wadi Tarabat proposed study has been put on hold until the extent of current development has been determined. We have participated in the 2nd Annual GCC Medical Students' conference at the Faculty of Medicine (Tawam) and sent a representative to the Emirates Environmental Committee gala dinner in Dubai where the Al Ain Chapter was presented with an award. I would like to welcome our new Secretary, Stephen Roney; Denise Lee, who lists Geology as her prime interest, as well as Melena Panteva, who has volunteered to help Gerry with upcoming photo competitions.